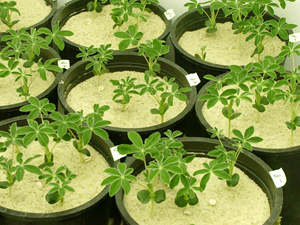 White lupin (Lupinus albus L. var Ultra) was grown in the growth chamber in sand culture under growth conditions as previously described (Johnson et al., 1996a). P sufficiency or deficiency was defined by the presence or absence of 0.5 mM Ca(H2PO4)2 in the nutrient solutions, which were replenished every 2 days (Gilbert et al., 2000). To maintain equivalent Ca2+ concentrations, the nutrient solutions for the -P plants contained 0.5 mM CaSO4. Johnson JF, Allan DL, Vance CP, Weiblen G (1996a) Root carbon dioxide fixation by phosphorus-deficient Lupinus albus, Contribution to organic acid exudation by proteoid roots. Plant Physiol 112: 19-30.